A Week In The Life of a FIRE Household - Can I Retire Yet? My journey to financial independence and retiring early (FIRE) started largely because I was burnt out on my career. This led to an oversimplified solution. If my career was the source of my unhappiness, I should pursue the opposite: retirement. In the process of planning for early retirement, I realized retirement with no work and no income would solve some of my problems while creating new ones. A traditional retirement became less interesting. It would be easy to dismiss critics as internet trolls who lurk in the shadows and sling arrows. But it’s not that simple. Recently, Carl Jensen was featured in the New York Times article How to Retire in Your 30’s With $1 Million in the Bank. Jensen shares his story, which contains many parallels to my own, at 1500 Days to Freedom. 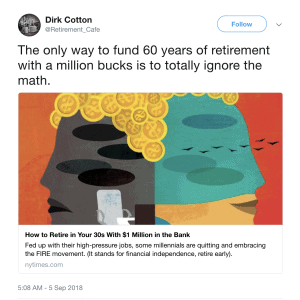 In response to the article, Dirk Cotton tweeted: “The only way to fund 60 years of retirement with a million bucks is to totally ignore the math.” Cotton is no internet troll. He’s the creator of the respected retirement planning site The Retirement Cafe. Cotton’s comment is probably accurate if we’re talking about a standard American lifestyle and a traditional view of retirement. Many of us who write about FIRE use the word retired, because there’s not a better term for what we’re doing. But we advocate for something genuinely different than common perceptions of retirement. For the week of August 27th to September 2nd, I tracked how I spent my time in a “typical” week. I’m sharing details of our life to demonstrate some principles of FIRE, allowing you to assess if a similar lifestyle makes sense for you. On the week I tracked my time, I “worked” 22.5 hours. This consisted of a variety of tasks including publishing a blog post, responding to emails, interacting on social media, rewriting a book chapter, meeting with a potential blog advertiser, and being interviewed for an upcoming podcast. I spent another five hours performing house work; cleaning the house, mowing the lawn, running the weed eater, grocery shopping, and doing laundry. My wife continues to work 80% of a full-time work load (32 hours per week). This consists primarily of doing analytical work with a flexible schedule. She is location independent, with the ability to work anywhere in the world with a secure internet connection. She has occasional meetings that require her to be at her computer at specific times. This generally ranges from 2-8 hours/week. The rest of the time she is free to determine when she wants to work. There is a misconception that people who write about FIRE “aren’t really retired.” Instead, we leave full-time jobs to become full-time bloggers making 6-figure incomes from our websites. I left a full-time professional job with a high five-figure salary, four weeks of paid vacation, and a generous health insurance plan. On the positive side, I also left behind a 40 hour work week with a fixed schedule of often repetitive tasks, ever increasing paperwork, and an hour daily round trip commute. I now work on this blog and have been writing a book. I’m highly unlikely to earn five figures this year. My schedule is variable. I work when and how much I want from anywhere I want. Over the summer, I didn’t average 4-5 hours of work/day as I did in the week I tracked. I was working closer to 4-5 hours/week while focusing on being a stay at home dad, exploring our new area, and settling into our new home. It’s rare for me to have more than 3-4 scheduled obligations in an entire month. I had two meetings the week I tracked, because I’d been putting off any scheduled obligations until my daughter started school. My wife’s job requires more stringent obligations to her employer. Though she hasn’t retired, she’s used our financial situation to gradually improve her working conditions over the years. She hasn’t worked a 40 hour week since the birth of our daughter nearly six years ago. She began working remotely for her current employer about four years ago. Her work involves no commute, rare mandatory travel, and considerable flexibility in her schedule. She has also benefited from my retirement. She previously did the lion’s share of housework when I was working. Her household duties now consists of doing the cooking and fixing our daughter’s hair in the morning, mostly because she doesn’t approve of my way of doing either. A common refrain I hear from those nearing retirement is they can’t wait to throw out their alarm clocks. Many people looking forward to retirement crave having freedom with their time. While I understand the sentiment, too much of anything is a bad thing. (See water intoxication). After a summer with very little routine, I’ve realized I need structure. My original motivation for tracking my time for the week was not to be the basis of a blog post, but trying to re-establish a routine like I had from the time I retired last December until we moved in July. This means having a regular bed time and regular wake-up time. Good sleep is vital to good health and being productive. We try to be in bed reading with our daughter between 8 and 8:30 each night, have her sleeping by 9 o’clock, and for us to be asleep no later than 10 o’clock. On weekdays, we set an alarm for 5 AM, though it’s rare that either of us sleep that late. We prioritize the most important things to us and do them first each morning. For me, this means taking the first 30 minutes of each day for quiet time and spiritual development. On Mondays, Wednesdays, and Fridays I do a different twenty minute HIIT workout routine followed by about thirty minutes of stretching and postural exercises. Thursdays and Sundays I do an hour of yoga. Tuesdays, I clean the house so I have it done and my time is free when I may want to do other things. Saturday is free to catch up on anything. This daily routine allows me to accomplish the most important part of my day before we wake our daughter and have breakfast with her. When I was working full-time, life revolved around work. My wife and I frequently went weeks without getting out and doing our outdoor hobbies together. We often struggled to find 10-20 minutes of uninterrupted time to have a conversation. Weekends were often spent catching up on housework we couldn’t get done during the week. Now, we fit work around life. What does this look like? On the week I tracked my time, we spent significant time together four of the five weekdays. Monday we walked for an hour at lunchtime. Tuesday we went rock climbing from 11 AM to 3 PM. Wednesday we did a long hike from 8:30-11:30 AM. Thursday morning we did a 90 minute mountain bike ride. Not only did we have the time to do things together, we chose to do the less strenuous things in the afternoon when it was warmer and do the more strenuous activities in the morning when it was cooler. Friday, I spent the entire afternoon with my brother who arrived the night before for a week long visit. We were able to fit in all of our work and house work obligations, have abundant time together, and still be done with our work days by the time I would pick up my daughter from school. Saturday was completely free of any obligations. My brother, wife, and I hung out all afternoon while my daughter was in and out playing with the neighborhood kids. Sunday morning, my wife and I hiked to Snowbasin resort. My brother drove my daughter up to meet us. The four of us spent the afternoon watching a free concert. We have achieved a lifestyle of financial security, freedom, and flexibility far earlier in life than most. For us, achieving FIRE was as much about learning to be happy with less as earning and saving a lot of money and building our investment portfolio. Part of our low spending is because we enjoy low cost activities, centered around outdoor adventure. Part is because we meticulously work on eliminating things that add no value to our lives. Examples are apparent when looking at how we spend our time and money. We’ve focused on minimizing driving. Most days I spent less than 15 minutes in the car and I rarely drive 10 miles in a day. My wife didn’t get in a car on four of the seven days I tracked. Almost everything we do on a recurring basis is within 1-3 miles of our home including our daughter’s school, the grocery store, restaurants, bike and outdoor shops, and the library. Our church is an eight minute, 5 mile drive. We walk to trailheads with abundant hiking, mountain biking, and climbing. Our only regular activity that involves driving 20 minutes or more with any regularity will be skiing in the winter. We made a contrarian move of downsizing our living space, even as we are now spending much more time at home and have a child. Our old home was two stories, had three bedrooms, 2 ½ baths, a formal dining room, a living room, a family room, and a formal entryway. It was about 2,200 square feet. We also had a large yard, an attached two car garage, and a large unfinished basement. We found it brought more stress than pleasure. Our new home has a primary living space of just over 1,000 square feet, all on one floor, with three bedrooms, one bath, and an open kitchen, eating area, and living room. We also have a one car garage and a smaller yard. This means far less time spent on cleaning and yard work I detest. I was able to perform all our weekly household chores in about five hours, about the time it took just to clean our old house. Spending money in alignment with your values is not the same as not spending any money. We spend freely on things that add value to our lives. A few examples were apparent during the week I tracked. On Thursday, my brother arrived to stay with us for a week. My wife and I have always been close with our families. We moved across the country, away from them, after I retired. It’s important for us to be able to make them welcome and comfortably host them when they visit. Even though our primary living space is much smaller in our new home, this house has a separate mother-in-law suite with an additional two bedrooms, private bath, kitchen, and small living room. We paid more for this space, furnished it, pay higher than necessary taxes, and have higher than necessary utilities to maintain it. It’s worth every penny to us. We’ve already had people stay with us three times since moving here in July. My parents will be spending a few weeks in October. On Friday night, we took our daughter and my brother to a Jack Johnson concert at USANA Amphitheater in Salt Lake City. It wasn’t the most frugal way to spend a Friday night, but Johnson is my wife’s favorite artist, one of my daughter’s favorite albums is the Curious George soundtrack (recorded by Johnson), and my brother likes seeing live music. Going to the concert also gave us a chance to spend an evening with our neighbors, who told us about the show and invited us to join them. It was well worth the cost to us, so we went and had a blast. Returning to Dirk Cotton’s tweet in the introduction, he is right that FIRE involves an element of risk. Where he is wrong is to assume these are not calculated risks and the math is being ignored by those who pursue FIRE. As we assess our situation, running out of money by retiring early is a risk. That’s why we’ve taken multiple measures to mitigate this risk. Building an investment portfolio to 25 times our annual spending (the inverse of the 4% rule) was only the starting point of our plan. Not factoring a likely inheritance into our FIRE plans. So while there is a risk that I left my job too soon and we could run out of money, the risk is small. There are bigger financial and life risks. Analyzing our situation, there are at least three risks which would have an equal or worse negative effect on our finances and/or quality of life. They are divorce, one or both of us developing serious chronic health issues, and regretting missing the once in a lifetime opportunity to spend more time with our daughter while she is young. Leaving the workforce early will cost us financially. Not leaving early enough can have different costs. I’m not suggesting FIRE is a panacea that can solve all life’s problems. Having a better marriage, improving health, and being a better parent all take ongoing work and effort. I’m also not so ignorant as to suggest that those who choose a more conventional path are doomed to divorce, disease, or that you’re poor parents. I will say that our time is now being spent in much greater alignment with our values than when we worked full-time. We sleep longer and better. We spend much more time together as a couple and as a family. Daily stress is less. We’re able to get out and be far more physically active. More time is spent on preventative health measures. All of that was considerably more difficult when our lives revolved around jobs. Since I left my job, we’re seeing improvements in our relationship, in health issues we each were experiencing, and we have far more time with our child. I’ve written and talked frequently about the need to redefine retirement. Many people are stuck in the dichotomy of full-time work followed by a traditional retirement. They consider anything outside of these norms as breaking the rules about what retirement is or should be. It’s important to realize that most of the rules that trap us are created in our own minds. What is the ultimate goal for anyone seeking early retirement? I’d argue it’s the ability to align your daily life with your values and to do it as soon as possible while achieving financial security. I did that and walked away from my career, so I say I “retired”. Whether you call it retirement, FIRE, financial independence, location independence, lifestyle design, a fully funded lifestyle change, what author Brian Portnoy would term funded contentment, being a stay-at-home parent, or anything else doesn’t much matter. I don’t know exactly what to call what we’re doing. It doesn’t fit neat labels, but it’s working for us. If you bloggers chatter amongst yourselves that those of us who question your use of the word “retirement” to describe yourselves as “trolls”, then that’s your problem and it contributes nothing to the discussion. You have all chosen writing as some part of your new career. You know that words are important. The word “retirement” already has a meaning. It’s taken. You can’t have it. You did NOT “retire”. Find some new words. Then the argument goes away. Done and done. I agree that the word retirement stinks. It means to stop working and I’ll never stop. However, my work is now optimized around happiness instead of money. For the first 3 years of my blog, I made about $100 total. I didn’t care because I loved the work. Now, it makes more than that and I still love it. If you’re doing what you love and you get paid, you’re incredibly fortunate. I’m thankful every single day. Bingo Chris. Folks can call it whatever the hell they want. As long as I’m excited to get out of bed every morning, I’m gonna keep doing it. Likewise I blogged for years with no income, more accurately I paid (web hosting, etc) to blog. If I stayed with my old blog instead of partnering on this one, I would still likely have little or no income. But I would still be working on it because it interests me. Would that make me more retired? Likewise, I’m working on a book. If it sits on my computer, is never published, and makes me $0 would that make me more retired than if it gets released and becomes a NYT best seller? Either way, I worked on it. At the end of the day, it really doesn’t matter if you’re retired or not. As you said perfectly, what matters is if you’re “excited to get out of bed every morning.” I recommend everyone try to get to that place as quickly as possible. I agree that it name calling and arrow slinging is unproductive from either side, which is why I try to write with transparency and honesty while allowing people to decide for themselves. I also agree that words are important. Where I disagree is that we can’t redefine retirement. The standard approach to retirement is simply not working for a lot of people, yet many don’t understand all of the options available because of the perception and definition people CHOOSE to accept. We’re all free to choose our own path. I think the principles of FIRE are superior to an all or none life that revolves around a career until retiring to a life with no work and no income. Those are the rules for life many blindly accept, but it doesn’t have to be that way. That’s why I write about this topic. It’s obviously a fine topic to write about. But I’ll say again, as Carl did above: “retirement” means ceasing to work. That’s the dictionary definition. Do not try to redefine the word. Don’t try to apply modifiers to it. The only modifier that makes any sense to me is “early retirement” which means ceasing to work (at all) before the customary age where SS and Medicare are available. Anything more just leads to arguments about attitudes and mindsets and perceptions. Which you bloggers do in fact need because it keeps the page clicks coming as part of your new career which is NOT “retirement”. Larry, ask any English teacher, words get redefined all the time. The shorter the word, the more meanings it tends to have. If somebody wants “bread” to mean money, all the naysayers in the world can’t stop it, no matter what the dictionary says. That’s why we don’t still use the same dictionary from 100 years ago, language evolves. You still sound pretty driven to me, which presents its own issues no matter how you want to define yourself to support your own self-image. You don’t just throw a switch on this when you leave what you call a “job” you hated to activities that make you feel “more in alignment.” You say you are happier now, so good on you. Enjoy your time as you will, but why insist that others validate your meticulous self examinations? That is more of a waste of time and energy than working for the man, IMO. So, please move on, find things of interest to talk about that hopefully involve more than your spreadsheet of time perfectly spent in pursuit of your upgraded image of yourself. Or we’ll move on, as the case may be, because this circular conversation goes nowhere. It is not helpful for those seriously moving toward FI and for those of us now safely on the other side of that chasm, it is kind of silly. Here a little amateur psychoanalysis for you Ray since you felt this is a proper forum to insult the author, question his motives, and show your closed mind to other ideas on retirement. You sound like you are not happily retired Ray. Did putting down Chris for his own admirable lifestyle choices make you feel better about yourself, just as you accuse him of doing? I highly recommend a book for you by Erie Zelinski called How to Retire Happy, Wild, and Free. So please move on as you say, find a blog more aligned to your own limited ideas on retirement. I’d disagree. It’s very important and helpful to have real discussions about the options available to people “seriously moving toward FI” and for those now “safely on the other side of the chasm.” I’m in groups and have gone to meet ups with people pursuing this lifestyle and my wife and I continue to work through our own transition and figure out what exactly we want next for our family. It’s not easy to live a lifestyle so different from what we see every day. It’s also not always fun being someone who puts yourself out there for criticism, but I do it because it is a conversation worth having. Out of curiosity, if you’re on the other side and have it all figured out, and think this is all a waste of time, then why are you reading an early retirement blog and taking time from such a fulfilling life to participate in a conversation so “silly”? Chris, I read it for Darrow’s comments, obviously. I’ll move now, thanks for the reply. Thanks for the kind words and the book recommendation. I added it to my reading list. Fantastic book for anyone contemplating retirement. It focuses on the non-financial aspects of retirement and I go back to it often for inspiration. MB: I read Ernie’s book a long time ago, and enjoyed it, thanks. I am really happily retired, and am actually retired, per Larry’s definition, above, which I highly recommend to all it may appeal to. In my dad’s era, Chris would be called unemployed, or “between jobs”. In my era, he would be called self-employed after quitting a job which was what a lot of us did for all kinds of reasons. You know, like free-lance consultants and so forth. It didn’t seem to need a new category or legions of bloggers to define it. You worked for your self and basically made your own hours. Sound familiar? Trust me, having done both, retirement is not the same as working free-lance. They both have their benefits, but once you hang up your lance, if that suits you, actual retirement is a beautiful thing, indeed. Thanks. I think that defintion of retirement is fine too. Bingo MB. Traditional retirement isn’t wrong and I’m certainly not attacking that if it works for anyone. However, for many people it doesn’t work well. Many people deteriorate mentally and physically quickly in retirement. I believe a lot of that is because people lose purpose without work. If you don’t want to work that’s fine, but you need to know where that purpose will come from without it. Yep, MB, I do know a few friends like this. And what they typically do is work part-time, often in the same field they were in, or as freelance consultants, sometimes even for their old bosses. Ask these folks what they do and they say they have cut back and work part-time now, or do freelance work and enjoy the new work/life balance. They never say they are retired. Another friend volunteers 2-3 days a week as an unpaid docent at our local museum, loves it, and is absolutely retired and delighted to be so. But these flexible options have been available to our society for many decades now, so I don’t think this is news to anyone, right? You can explore these trade-offs any time in your life that makes sense to you and your family. I just don’t see why if your primary focus continues to be on income producing activities (no matter what your FI status is) you would want to say you were retired. Maybe it conveys some status or accomplishment badge that I am missing. Calling people names and acting like an a@# to people that disagrees is exactly what is wrong with today’s society. Wow Ray, pretty negative there. I personally found this article very interesting, enough so that I shared it with my siblings. We’re all either approaching or just past the point of retirement. I’m 4 months away from it, and after 45 years of having bosses and having my life centered around jobs, I find myself spending a lot of time thinking about what my schedule will be like after I make the switch. There have been a few similar threads on here about the pursuit of happiness, and whether you can get there better by simple retirement activities like fishing, vs doing more productive, meaningful things. It’s a real issue for me, and I’ve been discussing it with my siblings and coworkers. I know how to work, but I don’t know how to relax! So this post that goes through a typical week gave me valuable inputs. Feel free to “move on”, your negative comments added zilch to the discussion. Good luck with your forthcoming retirement, Michael. Four months away, congratulations! Well, you will certainly get a chance to learn how to relax now, if it suits you. If not, there is plenty to do in the world and you seem to know how to do that. By Chris’s, and others’ new definitions, even if you are still doing paid stuff but don’t have to, you are “retired,” so you can have it both ways and be ok! In my working life, the purpose of paid work was to get paid. All the other so-called benefits from that engagement could be obtained elsewhere quite easily for me, and had nothing to do with getting paid. That kind of stuff just continues, but in the forefront once you pull the retirement plug. It worked for me, and it sounds like you will be just fine, too. Best wishes. It is truly hard to just flip a switch and go from life centered around jobs to complete freedom. We also, my wife especially, have a hard time relaxing for long periods of time. We’re very happy with the more gradual (and different for each of us) transition as it allows us to see what we really do and don’t want. Now that I’m approaching a year since leaving my career, I can say I haven’t had one day where I missed going to a job. But, I have found other things to fill my time that I love more (moving closer to outdoor pursuits, writing, being a better dad) and I’m starting to explore more service opportunities to start giving more of my time rather than just money as I had traditionally done. I really think that retiring to something, whether it is different work, hobbies, travel, service projects, etc is key. Best of luck on your transition. In Spanish, we have a word we use for retirement: a retired person is “jubilado.” It also means freedom, to be set free. I think what you guys are experiencing is really jubilación! So yes, maybe you need a new word for it! I sort of like that it is close to the English word “jubilation–a joyful or festive celebration” which is also an accurate description! I now think of retirement as a state of mind. I have been working part-time for many years but never considered myself semi-retired, although I could have. I am making the transition now to re-thinking my situation but it makes no difference to anyone except myself. I think it has to do with whether your life is centered around work, not necessarily how many hours you work. Thanks for the comment Beatriz. I kind of agree, everything in life is about state of mind and the story you tell yourself. I don’t say that in a negative way, because I think how you approach life has a massive impact on what your life experiences will be and the outcomes you achieve. That said, I think there is more to retirement than just state of mind. If you love your job, but are deeply in debt and/or are living a lifestyle you couldn’t sustain without that job, then you’re not retired. It’s great that you love it, but it is a precarious financial position to be in. Likewise, you could be a miserable person, living a life of deprivation scraping by on social security in your old age and no one would argue you’re not retired because you’re not jubilant. The whole FIRE movement is really much bigger than early retirement. I think most of us care much more about achieving financial independence part and then having the freedom that you mention to do whatever they want without being boxed in by any definitions of what life should look like. It’s easy to be retired when the wife works 32 hours per week. I think it should be the other way around. I see more and more women working while the husband decides to do whatever he feels like it. Is it easy? Have you ever looked at statistics on savings rates, absolute dollars saved, etc for the average American household, regardless of income. We could reasonably maintain our current lifestyle living off of investments without her income. What’s easy is to tell someone else that what they’re doing is easy. Have you ever considered that my wife is my equal partner, and that we talk about what is best for our household and our lifestyle (including our daughter) without money, ego, or traditional gender roles limiting our choices? Have you ever considered that we talk about what is the best way to be able to give more and our desire to always be able to give generously is a major motivator to her continued working as well as my experimenting with making money off projects like this blog? It would be easy not to consider those types of things if you haven’t actually done it. We have. It’s not easy. That’s why I share to get others thinking and talking about these topics. I stopped working for a large, software company early last year. When friends and family ask if I’m retired I say “I don’t know, I call it semi-retired”. I don’t need to go to work in an office, have meetings, travel to meet customers internationally, or prepare presentations for the boss. I enjoy the freedom to spend more time with my family and travel. I experiment with being a restaurant reviewer and travel blogger but neither provides any income (although dinner for two at nice restaurants for free is pretty good). My wife “retired” many years ago to raise our four children since we could afford it. She still taught singing privately for a couple of hours a week, and traveled with me occasionally when I went on a business trip to Europe. I don’t think the R is FIRE is useful since it appears that no one is truly retired. Being a paid blogger, author, eBay seller, etc., however little income it generates is still working (it takes time, generates income and taxes) but it’s is self-employment and that’s a good thing. Traditional retirement is relatively easy if you have a job that provides a healthy and reliable pension income on top of Social Security, and you have access to decent and affordable healthcare (like most of our family and friends in the UK). Unfortunately, in the US this is not available to most of us so we need to be somewhat flexible about our definition of “retirement”. I think the trolls are mostly jealous that you’ve found a lifestyle that suits your family without needing to work a traditional job until you’re 67+. Appreciate you sharing your experience Steve. Agree that I’m not comfortable using the word retired. When meeting people for the first time, I generally just tell them I’m a writer or I “work from home” when I get the inevitable “So what do you do?” question. But for those getting serious about their options for retirement, I think broadening the definition and helping people define what they really want and can reasonably achieve is important so people aren’t stuck in traditional definitions which limit them. I chuckled when I read Larry’s assertion (1st comment) that the word “retirement” is taken and you can’t have it. That’s not the way the English language works. You can (and should!) write what you want and, if it resonates, the words and the language evolve. That seems to be happening with the word retirement. Many people working ordinary jobs think of retirement first in terms of no longer needing to do certain things in certain ways. Their aim is the same as yours in many respects, and that congruence seems to be driving a re-definition of the word. I think that’s good thing, both for individuals and for our culture. However I also like the suggestion that Beatriz made. I’d welcome a new word with a more specific meaning, to help improve our discussions of this vital topic. I really appreciate what you (and Darrow) have been doing. It’s helped me and my wife specifically, and I’ll share this post with her today. I would like to comment on the retirement language question. I left a career in advertising soon after my first child was born and earned a masters degree in counseling so I could be a better parent. I worked in that field until my second child came along. I then became a “stay-at-home-mom,” wrote three books and published one, had a third child, moved with the family to a log cabin on the edge of the Oregon wilderness, joined three boards, was the parent who hosted our children’s end-of-season team dinners, etc. My husband’s income was enough for the family, but we had very lean years. When my youngest could drive, I went back to work in the counseling field part time for 10 years. I refer to this evolution as “reinventing myself” which I have done many times, and I teach this strategy by example to my three children who are all successful adults. Are some of these language issues due to changing gender roles? Is “early retirement” simply the ability to reinvent oneself without financial worries? Since I am not an early retiree, I cannot say for sure. However, I appreciate your reinvention as an early retirement blogger – a benefit to this 62 year old recent retiree! I love the idea of reinvention without financial worries. To me that’s what it’s all about. Thanks for sharing your story and love that you’re teaching this to your kids. Just to be clear. I consider myself “early retired” at age 53 because I haven’t performed any work for pay since retiring and don’t intend to either. (A hard-earned pension, 30 year career in civil service after college, significant retirement savings and being married to someone with a similar financial situation made this possible). Can’t you be both retired and a blogger, author, entrepreneur, etc? I don’t think any of us go around in our every day lives bragging that we’re retired. I know I don’t offer that up right away. However, when writing a blog called “Can I Retire Yet?” I think it adds a level of credibility that I’m someone who actually achieved a position that I could retire, so I focus on that. Not all bloggers, authors, entrepreneurs are in position to retire, just as not all retirees know how to create a blog, write a book, run a business, etc. It’s not a simple black and white definition, despite what some here want to argue. There’s a lot of gray area and it’s worth talking about, b/c unfortunately many people don’t consider all their options. I have never commented on this topic before but have been surprised as to how people want to create their own definition of words that have already been defined in the English dictionary. Chris is financially independent by definition but not retired. He is doing part time self-employed work that he does not have to do if he does not want because he is financially independent. The fact is it may have started as a fun project that made no money has developed into a part-time job. I think some of the bloggers like to say they are retired early because it is creates more interest in their writing and followers. Saying they are financially independent and changing careers or doing self-employed work or working part time doesnt have the same click bait:). I think that’s pretty much what I just said as well, with the exception of the use of the word retired. Is this any different than a professional athlete that left their sport and now is doing color commentary on TV?Everyone would say they retired from their sport. I’ve never heard anyone say they’re “not retired” or feel the need to use qualifiers, even though they’re still doing paid work. For some reason, there is argument when we choose to have an above average interest in retirement planning and write about how we did it to help others. I don’t see any difference between us and the athlete, other than most of us got here without the massive salaries they have. So your definition of retirement is that you’re not doing any paid work? But you could do paid work if you give the money all away, so the definition of retirement is actually that you’re living strictly off passive income? Others say rental income is “not really passive”, those people aren’t retired they’re landlords. What if I spend 2-3 hours/year managing my portfolio of stocks and bonds? Is it not “really passive”. All of these lines are arbitrary. To me, retirement is about not needing to work because you have social security or other annuities (the only truly passive income) or other investments (paper investments or real estate) that can support you. Once you have that, you’re free to choose whatever you want to do with your life and that is the whole point of this discussion. So, interesting reading this thread. I’m sort of shocked to see how upset people are about the term Retirement. While I don’t have a dog in that fight, I can say this blog is valuable to me as I think about financial independence and how money and our relationship with it can support or detract from what we want to get out of life. Reading this blog has challenged me to think differently about what is important to my wife and I (experiences vs possessions) and what we want to do in our next stage of life as we head into our 50’s. It’s informed some decisions Im making now in how I’m planning to “downsize” out of a 25 year career with a relatively high income and traditional health benefits. I may keep working after I leave that job, I may not. The posts here have given me food for thought, so I thank Chris and Darrow for sharing their journeys. Thank you Wade for the kind words. That’s what motivates us to share our stories and I think that’s the value of a blog that goes beyond just looking at numbers. I agree with Wade. I have found tremendous value in following The can I retire yet blog Over the years. By sharing your journeys you have given us listeners much Food for thought, Bringing us insight and inspiration through your evolving path, demonstrating the possibilities we might consider in formulating and forging our own path. I currently consider myself semi retired even though I am working 40 hours a week. It just so happens that I reinvented myself. After being let go from a 24 year career, changed careers to something that pays much less, but I enjoy it, it provides health benefits, and in time be able to do from home; and in the back of my mind I know I am moving toward a financial place where work is a choice. This blog has helped me, so thank you! Thanks for the kind words Christine G! I’m with you Chris. Retirement is as much a state of mind as it is one’s employment. No longer am I defined by ‘what I do’ and I have had several careers in my life so that was never a straight forward answer. Whenever we reach the point to do whatever the heck we want – when we want, I consider that – retired (from the rat race). Don’t worry about the trolls and naysayers. You have obtained something they envy – let them stay mired in their 9 to 5 mindset. The rest of us ‘retired folks’ will just relax with a smile on our face. I’m really not at all worried about “trolls” and in retrospect should have probably left that line out of there. It is important for people to learn to think differently and find their own path which was the point I was trying to make. Thanks for reading and taking the time to share the kind words. Rather than nit-pick on whether Chris is retired or not, I prefer to focus on the value his blogs bring to me and others. I enjoy learning how he chooses to lead his life as it has many parallels to my own. The first person narrative in this blog segment provide insightful potential paths for my own life. He’s relevant to me and this is why I enjoy reading his posts every week. Much happiness to you, Chirs. Please keep blogging. Thanks for the positive feedback, and I plan to keep writing as long as it interests me and I see that it’s helping others. One thing that struck me in your original motivation was that weren’t happy in your work… so you “retired”. I think that sometimes people are mentally stuck with those as the only two alternatives. I recently went and talked to my boss of many years. I said that I didn’t want to work full time and that there were some kinds of work that I didn’t want to do. I wasn’t sure how he would react as I had never discussed my feeling with him. Somewhat to my surprise, he expressed an interest in meeting my “demands”. Instead of working full time, I went down to 3 days a week. Instead of managing people on a bunch of projects, I am doing my own projects and learning to program. BUT, I think that people need to remember that once you decide that quitting is an option you gain the most leverage you will ever have (assuming you bring value to your work situation). If you are valued, a rational workplace is going to try to make you happy if there is a way to make that work within the company culture and business model. Bottom line; if you are unhappy enough in your job (or in anything else in life) try to do something about it. Quitting is a good solution but not the only solution. You hit the nail on the head. I was one of those people who was stuck. I think if I would have started thinking differently, I would have pursued a more gradual path to retirement with part time work before totally burning out. I probably wouldn’t be retired now, buy I also may have been a lot happier during the time I was working. By the point I figured it out, it was easier to just pursue a different path in life through early retirement. I still have my PT license, and honestly was 50/50 whether I would want to return to at least part-time work when I quit, b/c there are aspects of my work that I loved. But now that I left I would say I’m 95% sure I don’t want to do that type of work anymore, at least not in a traditional setting which I grew to hate. I have been a stay at home dad for 19 years, I too left a high paying high stress job to raise my kids and my wife still works. So I guess if I compare my situation to your situation then I have been retired for 19 years and did so before the age of thirty five.. Good for me, I thought I was just like all the other stay at home parents, I did not know I was retired. Dang I wish I knew I was retired, that way I would not have had so many people look at me funny for being a stay at home Dad, (it was not very common back in 1999 to be a stay at home Dad) well I am off to tell the other stay at home parents that they are retired too. I recognize the sarcasm, and that’s fine. You do make a great point that whatever you want to call it, when you take a different path than what is expected of you it is hard at times. It’s a lot easier to just go to work because that’s what you’re supposed to do. No one will judge you. It’s hard to step outside of what society expects of you. People may think you’re lazy, or crazy. But developing the ability to not really care what other people think allows you to live the life you truly want, instead of what you’re supposed to do. I love many of the FIRE blogs and podcasts. Mr Money Mustache, Doughroller, Darrow and you. It has helped me see financial freedom in a totally different way. Call it anything you want Chris, just do not stop writing about it! Thank you!!! Thanks for taking the time to share the positive feedback Jeanette. Hey chris hope all is well. i enjoy reading your blog . if people would just relax and calm down.your doing a great deed for people. thank you for what you do. I thought the term “trolls” was harsh. Then I read the comments. Nothing wrong with being happy with your life; enjoy retirement. After a summer of being a full-time stay at home dad, I can attest that is a lot of work! Whatever you’re calling it, sounds like you are finding a good balance between family and money. Cheers to you! I enjoyed reading this blog, and many others on the FIRE movement. I am interested in reasonable (not extreme) frugality and minimalism. After reading many of these FIRE blogs and comments, I must admit one aspect bothers me. It seems to me that many of the bloggers and comments left note that your do not need much money when you have a very low apparent income. That is, health care is free or highly subsidized, income tax and capital gains taxes are eliminated, and in most states property tax is income adjusted. Their children receive great ‘need based’ scholarships for college. Yet, to me, this is not financial independence, but shifting one’s costs on to the backs of others. The public schools, police and fire departments, national borders and defense, roads and infrastructure all must be maintained, and all of these services are still utilized by the FIRE individuals. So perhaps this could be more termed ‘financial dependence’, because essential goods and services are provided by others who are working and paying taxes and tuitions. Again, thank you for the interesting blog, and your patience with my view. Happy to allow any reasonable and constructive points of view as these comments show. That’s the way insurance and taxes work. Some people are always paying in more than the benefit they’re getting out, while others are getting more benefit than than they’re paying in. No stats to back this up, but I’d guess early retirees are net positive or neutral over their lives. I also think that early retirees do more good than harm for society by using less resources by living lower consumption lifestyles, having more time to do things that matter which often ends up meaning giving back time through volunteer work, starting side businesses in retirement which add value to the lives of others and continuing to generate taxable income. We’re also focusing on living healthier lifestyles which reduce burden on the health care system, etc. Rarely are things simple and black and white as we’d like them to be, be it retirement, financial independence, etc. Thank you for your prompt and considered reply. I agree with many of your points about healthier lifestyle and perhaps more time to ‘give back’. However, the math is likely: how many years does a FIRE person pay taxes, and how many years does a FIRE person receive goods and services but not pay for them? Many of the bloggers boast of retiring in their mid 30s, which equates to maybe 12-15 years of paying taxes. Yet a life expectancy of 85+ years suggests 50 years of being subsidized. I do not throw the baby out with the bath water: there are wonderful aspects of low consumption lifestyle, but I think ‘financial independence’ is a misnomer for cost shifting personal and societal expenses onto the unwitting backs of others. It’s an interesting conversation and likely one we’ll have to agree to disagree on b/c I don’t know how you would ever quantify whether a single person is a net giver or taker over the course of their lifetime, let alone generalize it over a population of people with diverse paths and stories. Thank you Chris for your prompt and respectful replies. I guess that we must agree to disagree. Your blog is about FIRE, and I agree with minimizing consumption and modest frugality. I cannot agree with your dismissal of the math: FIRE individuals do not pay for their fair share of government infrastructure and medical expenses: Any even half-serious analysis would reach that conclusion. However, let’s agree that minimizing conspicuous consumption and good savings/investment habits are worthwhile. I wish you the best on your blog! I will continue to read and respect your posts, and appreciate the efforts you put into them. There is no need to respond to this post. This is something that’s been discussed for a long time in these circles. Here is an old post that Darrow posted on this site from 2015 that you may find interesting. On the subject of FIRE individuals not paying their way. I’m deep into doing the math of early retirement – taxes change but they definitely don’t go away. The taxes on my 401k are deferred not gone. Sales tax, gas tax, school taxes, property taxes, and income tax – “retired” or no they still have to be paid. And health insurance, that doesn’t go away either. If you decided to leave your career knowing full well you could not provide for yourself and would be a burden to others, that would be irresponsible. But that’s not what we’re talking about here. I’d tend to agree more with you Candace. The idea of someone fully retiring in their 30’s or even 40’s then never doing anything productive that earns income for the remainder of their lives, thus paying pay no income taxes and maximizing ACA subsidies is possible, but I would imagine extremely rare. Even my “extreme” story of retiring at 41 comes with my wife continuing to earn substantial income from her part-time work and this is how we get our health insurance, so we’re continuing to pay income taxes, not getting subsidies for our health insurance, and are not converting IRAs to Roths because the benefits would be small given that even our relatively small earned income fills up our personal exemption, the 10% bracket and a portion of the 12% bracket. We also are home owners and as such pay property taxes, we pay sales taxes, and our relatively high net worth means we’ll likely get little student aide for our daughter when it comes time for college. I think that’s a more typical representation of a FIRE person than a person completely retiring after 10-15 years of work and then being a perpetual drain on the system. After reading the article, it sounds to me like you are a stay-at-home dad that runs a blog on the side. It’s been a while since I have chimed in. Due to our very similar situations (similar career with the accompanying burn out, choosing to downsize, reaching financial Independence, part time work, working spouse with healthcare benefits, etc. ), I find many of your posts valuable and encouraging. They provide me with great insight and ideas as my wife and I continue to redefine our path. I especially enjoyed this post. As have mentioned in past comments, I have chosen to continue to work part time (although lately it’s been much more). We do so mainly as a safety net and to provide some structure to our routine. We continue to find it difficult to relax and let go of traditional employment. However, I found the description of your routine very inspirational. No matter how you or anyone else chooses to define retirement, I look forward to posts similar to this one. Thanks for the positive feedback Skip. I agree that a regular paycheck is addictive and having some income is a nice compromise allowing a lifestyle we’re happy with without financial stress of a traditional full retirement. Also agree strongly that structure and routine is a good thing for me. Some people don’t need it, but I think the idea of freedom is overly romanticized and harder to deal with than many people anticipate. Awesome that you’ve found a path that works for you. That much travel isn’t appealing to me, but the whole point of FI is you get to decide what your life looks like on the other side. 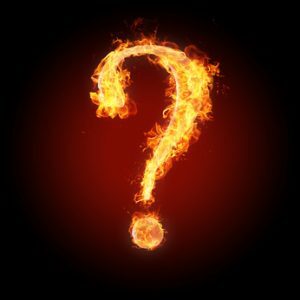 Another excellent article – and it helps me to get a better idea of how others approach the FIRE concept on a daily basis. One thought about risk. As a climber myself, the evaluation of risk has been a big part of my life for most of my life. For my mother-in-law and others, what seems like an unacceptable level of risk in climbing ignores – or doesn’t understand – the rewards of climbing. Through climbing and other outdoor sports, I gained a belief that some risks were worth it, and others were not. To this day, I still have conversations with people who figure that any risk is unacceptable, while others confuse risk with recklessness. I see it differently. There is always a risk/reward calculation, and the rewards I got from climbing (alpinism, primarily) vastly outweighed the risk, even though most of the rewards were not what others expected. Similarly with retiring early. There is risk in that my investment strategies may not pay off in the long run. But that for me, and my wife, is an acceptable risk. Why sacrifice today with a fear of the future. Yes, there is. In your case, you became a writer. Or if you prefer a part-time writer and stay-at-home Dad. A major shift in career / work focus does not equal retirement. Women have been routinely doing this for decades. Work, then motherhood, often followed by stay-at-home-wife & mother, and then perhaps returning to the work force in a different capacity once the kids start school or leave the house. That isn’t retirement either. Another example: while I enjoy The Frugalwoods and appreciate the changes they made to realize their dreams, what is often glossed over is the fact that her husband is still working his tech job, just remotely now. And she may have shifted her job from non-profit fundraising to writer, and also stay-at-home Mom, but that’s it. Financially independent perhaps, to be able make these choices, but not retired either. I’d agree that changing careers does not = retirement, nor does being a stay at home parent, nor does being an entrepreneur. What differentiates the path that I and others in the FIRE world have taken is that we’ve put ourselves in a financial position to retire and choose our paths in life that don’t focus around our careers. This is very different than what most people do between finishing their schooling and retiring in their 60’s or 70’s. Even stepping out of the workforce to be a stay at home parent for a few years or taking a 6 months to 1 year sabbatical to travel or care for a family member are great options if you can do it, but in reality many people can’t because of their financial situation. A theme that I find interesting in these comments is that I’m not retired, but I am financially independent. I’d argue if anything it is the opposite. I retired from my career as a physical therapist. On Friday Dec 1 I went to work just as I did every M-F for the prior 16 years. On Mon, Dec 4 I didn’t. I had the freedom to do whatever I wanted. I didn’t leave to take another job. I retired. It seems pretty black and white to me. However, if I’m being truly honest, I don’t know if we’re financially independent. I know we have enough to go a long time without needing income. At the same time I’m dependent on a number of assumptions being correct related to market returns, inflation, tax laws not changing too drastically, being able to obtain health care, etc. All are out of our control. Anyone who is being honest would say the same thing. I think doing some work, either for immediate pay or to at least maintain or learn new skills that would enable earning money and/or being able to obtain health care in the future, is a prudent strategy for anyone retiring in their 30’s, 40’s, or 50’s. There are simply too many unknowns to be certain of your financial independence for all but a few ultra-wealthy who probably aren’t reading this blog. For maybe 7 years as an avid reader of the FIRE community watching the whole thing develop, I was balled up mentally myself around the word “retirement.” I don’t care much what strangers online think but the right metaphor is important for my own sense of purpose. Something the writer and podcaster Roger Whitney says finally clicked for me, which is that retirement for most people is not an on/off switch but more of a dimmer switch. That’s a useful metaphor. The dimmer switch is what most writers in the FIRE space and even both of my parents have done, so it super-common. The problem with “retirement” is, the developed world’s 20th Century Industrial Age model of working 40 hours per week, 8-5, M-F with puny vacation time till exhaustion at age 60 then moving to Florida, the vast financial services industry that feeds off of it, and even this blog’s title (though not necessarily its content), all reinforce the deeply-seated on/off switch mentality. You simply must work until you can stop. Learning to manage the dimmer switch over many years is what would serve most people best. Having said that, I haven’t seen a word yet that I love for dimmer switch. “Semiretirement” is better but even that conveys a declining off-ramp to full time shuffle board. Dimmer switches can also be turned back up at will. We need a word that is dignified and explains quickly how a person embraces life and has positioned him or herself to spend their time as they choose, including earning money when they want by doing work that appeals to them. That condition is achieved thanks to smart habits, hard work, lifelong dedication to education, delayed gratification and good fortune, allowing the person to ignore the dominant 20th Century Industrial Age model. When I can come up with that word, I’ll write my own damn book! Thanks for the thought-provoking article. Great comment! You managed to sum up in about 150 words what my 150 page book manuscript explains. Thanks. I look forward to your book! I love the controversy stirred up with this highly touchy topic! 🙂 Do all your posts bring out the word police? I didn’t realize “retirement” was such a hot button topic… Keep stirring the pot, I’ll keep reading with popcorn in hand! I enjoyed your thoughtful review and time breakout for a week. I may track what I’m doing now in order to reflect in the future. I am working on my own financial independence which is actually a career change. I like helping people and but would like to continue to have structure in my day. Raising my two kids to be good people demands a more flexible schedule than a 9-5 (plus 1.25hr commute) with overnight travel that I’m doing now. Plus I really like being involved in their school activities – who would have guessed. I found your page through a link in Four Pillar Freedom blog / weekly email with favorite links. Cheers! Glad you found us and thanks for reading. I didn’t try to stir the pot or think I wrote anything very controversial, but the reaction shows how strongly people feel about what retirement is. For most people it means no work and no income, but it doesn’t have to be that way. For most people in their 30’s, 40’s, or even many retiring in their 50’s that approach will like be unnecessarily stressful and risky for those that get the courage to make the leap. More realistically, the mindset will keep people trapped working “one more year”. I’d encourage you to try the time tracking. I didn’t do it with the intention of writing about it, but I track my time for a week periodically to see where I’m actually spending it. That information provides interesting insights and helps me stay on track. When I leave my current employer in five years, I will be “retired” and start collecting a pension. I plan to work part time somewhere else in a different field. To my employer, I will be “retired” since I am collection a pension. I guess I will have to say I am “retired, but…”. I don’t need to work part time to sustain myself when I “retire”, I am choosing to work part time. That is my choice. Just like retiree can volunteer, sit and watch TV, do hobbies, play tennis, run a blog, teach, work on their car, etc. All those things involve work, but you are choosing to do them(well maybe not watching TV, Ha ha). How about this “I retired from _____, but now work on my blog”. Thanks for the comment. You make two key points. 1.) Retirement means work becomes a choice rather than a necessity. 2.) You don’t just retire from something, you retire to something. Best wishes to enjoy your home stretch and all that lies beyond.